Two articles from Stuff have sparked a long-drawn out battle over vaccines. The Facebook pages have drawn an huge number of comments, many posting ill-formed opinions. Yeah, it’s happening again. The Stuff articles themselves are mostly fine. The vaccine battles in the comments… not. I have huge sympathy for people being confused or misled, but I can’t say how much I wish people would first try understand rather than repeat false claims or launch insults at people. It’s a trait common with people opposing all sorts of things, GMOs, water fluoridation, and so on. We could spent literally weeks breaking down the claims made in these two Facebook pages. Those comment threads are an excellent repository of memes used to oppose vaccines. Better and more productive to step back at look at the wider issues. It’s important to realise that the correct comparison for vaccine safety is not with absolute safety. Everything in life we do has at least some risks. 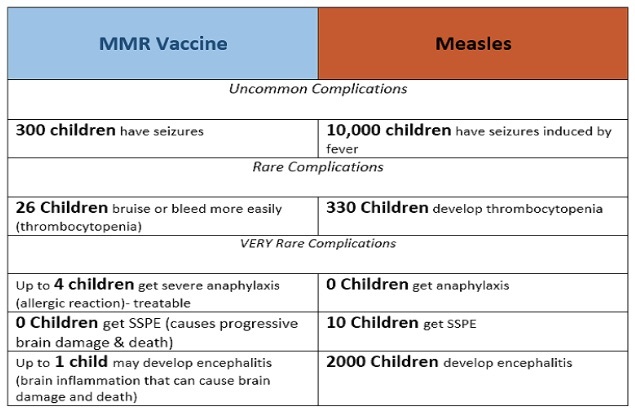 The correct comparison is comparing against not taking the vaccine. Vaccines do have side effects, but they’re not the excitable claims made in these sorts of “discussions”. Some people then point at this saying the vaccines are worse than the diseases. BUT if you let vaccination rates fall, the disease will come back – and surprisingly quickly. With that in mind, you’re much better to keep vaccination rates high; the effects of not doing that will be worse. A resurgence in disease will mostly affect the unvaccinated and those that aren’t able to take a vaccine. This is one of the reasons vaccination is better thought as a help the population to help yourself thing. If you pitch in, you benefit. If you don’t, you’ll lose if the disease shows up. A recurring pattern is parents who sincerely believed not vaccinating their children was the right thing to do, only to realise how horrifically wrong they were when the disease hit their kids. You don’t want to be one of those parents. I can’t imagine anyone wishing that on someone, yet some people opposed to vaccines directly say that – that your kid will be OK, that the illnesses don’t happen. Unfortunately the diseases do happen, and if you don’t prevent them you and your kids are sitting ducks for the disease if it’s making it’s way around your neighbourhood. 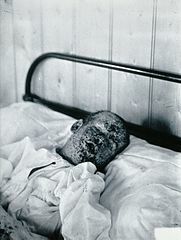 “Henry Wicklin, aged 6 years, as a smallpox patient. Photograph by H.C.F., 1896.” ©Wellcome Trust, source Wikipedia. This may be awkward, but you want to be skeptical of why the ‘core’ people hold views against vaccines do. This is anecdotal, but my experience is that most of the small knot of people at the core of promoting opposition to vaccines are wanting to have something to blame for their child getting ill. The potential link to vaccines is sometimes, if not often, quite obviously wrong, or exceptionally unlikely. Despite this it’s clear they wish to have something to blame, and are fervent “true believers” that it’s the vaccine has done it. Reality in life is that many of these things are simply blameless. I have a hearing loss from congenital rubella. There was no vaccine at that time so there was no way for anyone to protect themselves. As a result hundreds of New Zealand children were born disabled. Essentially, a natural lottery happened where some kids and their parents were going to lose out. Lest anyone think hearing loss is a minor matter, it’s not. It’s a lifelong affliction that affects you in more ways that all but a few truly understand. That’s the same for other non-fatal effects of disease. An excellent example was this reader who was losing her sight. She probably could “find” any number of things to blame, but she accepts it as how things go sometimes. She also accepts that at present there is no cure. It’s more than understandable that parents would feel strongly about their child’s suffering, but there’s no good sense in trying attribute blame. There is often a near frenzied hauling up of “facts” to defend their view that vaccine don’t work/cause harm/are evil. Small snippets from the enormous research literature are dragged out of context and held up as if in religious affirmation of their belief: how dare others challenge them, they do not hold the faith, they do not “see”, only the few are those that truly understand. I would also suggest parents realise that properly understanding research science papers involves digging very deep, even for the rare pieces of research that are meant to offer something simpler for the public. A pity is that this is being done by otherwise sensible people, quite capable of knowing better. Believing because others have said something is not the same as knowing. Reading more doctrine is not research either. A key to research is to challenge, to critique the claims made. Knowing comes from testing claims. You have to take your favoured ideas, and rip them to pieces. Find all things that might be wrong in them, track them down, and test them. Experimental science takes this further, testing in real life what might going on. You’ll often see that when people put up these claims opposing vaccines they don’t critique their claim, but demand that others “show they’re wrong”. Aside from that this tries to shift the burden of proof, it reveals that they have wrong approach to research. Science doesn’t take sides; science is about sorting out what is right. Too much time is spent attacking those that try explain why vaccines are fine. This ‘us’ vs ‘them’ battle isn’t helpful or useful. Everyone else is against them, “the others” are “the enemy”, only the “true faithful” know “the right way”. ** None of this will ever resolve an issue. It’s one reason why I dislike the argumentative approach. It’s understandable to want to! I do sometimes myself. The groups opposing vaccines encourage being argumentative, in part because it re-enforces the notion that there is something to “fight” for. You’ll notice that’s a self-fulfilling circular argument. Of course if you are argumentative, others will be argumentative right back, but that doesn’t make vaccines good or bad! My tribe, your tribe, lets fight is a nonsense, a bit of a childish one at that. It’s not helped by people taking explanations as if they were opposing them personally. I can imagine new parents looking at the mess of those Facebook comments, recoiling and wondering if they ought to hold off on vaccines. For parents, I suggest using better sources, ones relying on those who have tested claims — science, in other words. With that all this said, the oft-repeated advice “don’t read the comments” isn’t bad! Are too many vaccines too soon harmful? Vaccination rates in NZ and what do those that delay infant immunisation think? ** These fervent beliefs often remind me of the fervent beliefs of some ‘closed’ religious groups. Some of the Vaxxed movie promoters in New Zealand reminded me of it again. One example was bringing people up to the front to say how their child was “damaged”. Aside from the lack of checking or proof that was ever really the case, it’s very like religious groups bringing a few of the devout to the stage at the beginning to say how they were “saved”. It sets up a false moral wall: if someone challenges any point the organisers make, they point at these people to try shut down the challenge than address the point raised. From the CDC website, public domain. Excellent post, Grant; thank you. I had measles, rubella and mumps, in that order, all before I was nine months old. Fortunately with no long term problems. I have no recollection of the illnesses but am assured there was more than a little concern about whether I would survive. Obviously my mother did not have rubella antibodies, so I am grateful that she did not get the illness whilst I was in utero or I would have likely experienced the same hearing deficit as yourself. I remember lining up as a primary school child to get my MMR when it was introduced. No problems experienced at all – I’m still here and certainly no-one has raised any suspicion of autism spectrum disorder. I remember going to get my oral polio vaccine, and also the reason – the two children in my primary school class with calipers. I also remember both times I received vaccinia (smallpox) vaccination (not sure why, it wasn’t actually required, but obviously my parents believed in the benefits of vaccination). A little more recently I remember receiving the BCG when I started at medical school because my Mantoux test result suggested it was needed. And the subsequent itching and soreness at the site. After a single episode of influenza, when I was too ill to care that my temperature reached 41C, I’ve never skipped an influenza vaccination. I’ve also never since had influenza. Over the years I’ve been involved with dealing with two measles outbreaks, about thirty people all told. I’ve been really grateful that none of them required hospital level care. There were huge problems in ensuring the infection didn’t spread to others – like the transplant recipients who I was also caring for at the time. Last week I reported a potential measles case, and have been relieved that my potential diagnosis was wrong when the PCR was reported negative. I’ve never understood why people object to the miniscule risk of a vaccination when there is the potential to avoid the huge risks associated with infections that, over the centuries, have killed hundreds of thousands, if not millions of people. Give me a couple of days of itching any day if I can avoid the real potential of death or permanent disability from vaccination preventable diseases. Thanks for the long reply! It’s a thing isn’t it? People don’t think much of ’flu until they get it, then they do! The last time I had the ’flu it was a major expedition to get 10 metres from the bed to the toilet. Also: perhaps influenza might be a “hidden” disease in that people who get it are stuck at home; few get to see what it looks like – ? There’s a parallel of sorts with the other diseases that many don’t think much of until they, or their kids, get it. It’s a pity when people have to learn it the hard way. In an recent post I included a photograph of a Lao grandmother and two of her grandkids. Apparently she’d walked 6 hours carrying them to get them vaccinated. These people see the effects of the disease, something few ‘Western’ people do. I imagine Westerners in the early days of vaccines were more like that Lao grandmother, really wanting this intervention that would prevent them and their kids from the diseases they could see around them. i’m really sorry to learn of your hearing loss grant – i can’t imagine what that’d be like. also, i fully endorse your wish that “people would first try understand rather than repeat false claims or launch insults at people”. my question is prompted by your reference to gmo in a vaccine post. i know you’re keen on both, and i know that some people who are keen on both assume that it’s the same people opposing them on both issues, but it’s not. my kids were vaccinated and my cows are vaccinated but i see serious risks in outdoor cultivation of gmo in new zealand. one reason for this split view is that vaccination is insurance (protection against a negative) but outdoor gmo in nz is the opposite of insurance (risky pursuit of a gain). do you understand? One thing I didn’t mention is confirmation bias, but perhaps I can tackle that in another article. It’s important the people consider the points made, rather than try listen on to a “side”. And you ought to consider them, not dismiss them out of hand – although that can involve a bit of work. I try to go back to the original reference people point to and see what it really says, and what it’s actually based on, for example. It takes too much time for me to do much these days (and probably just as well anyway) – shades of the point that it’s easy to make a claim, but harder to (properly) refute it. More on that some other time! Yes confirmation/rejection bias is a problem alright. One of the symptoms is deflection/avoidance, which is a a sure sign that the points made have not been properly considered. I try to keep my points clear and simple, but some people just refuse to engage. “Nothing in life is to be feared. It is only to be understood” — Happy 150th Birthday to Marie Curie, a true pioneer in science. Later I replied to John and another person pointing out that it wasn’t conflation, that it was about how people treat a subject. I didn’t merge the two (what conflation means) in the way John suggests, and it’s very easy to see that fear-mongering, and basing arguments on fear, is common for people opposing all sorts of things, not just those two topics. For example, look at the #vaccine and #GMO streams on Twitter. Similarly it’s common in “discussions” online, and not just in response to media stories! There’s a tendency of (some/many) people to think that “their” crowd is above this, that they don’t do it – even when they in fact do. It’s a very human thing. I touch on it in my essay. For what it’s worth <a href="https://respectfulinsolence.com/2012/09/24/bad-science-on-gmos-it-reminds-me-of-the-antivaccine-movement/"others have compared approaches by those two groups. I once thought to write on this as my view slightly differs, and I said as much online. Anyway, in reply I pointed out to John he was making the conflation himself. (My reply may not be ideal but to be polite about it I get tired of John’s “reading-into” my tweets then making me out to have said things I haven’t.) John seems to not “get” his mistake, but I can only do so much about that. Be very careful about offering sympathies to people with disabilities. In general, just don’t. Perhaps I should write a piece on this, it’s a common mistake. my question is prompted by your reference to gmo in a vaccine post. Which makes you off-topic by the way; this is about vaccines. I’ve never made that assumption, nor said that, nor implied it. (i.e. this plays to a straw man.) I suspect very few people make that assumption in practice. It’s also disconnected from the article. The introduction to this article (and my tweets) doesn’t say the same people were involved, never mind two particular groups of people, but says the same general approach is often taken by people opposing all sorts of things. That was stated quite explicitly! my kids were vaccinated and my cows are vaccinated but i see serious risks in outdoor cultivation of gmo in new zealand. one reason for this split view is that vaccination is insurance (protection against a negative) but outdoor gmo in nz is the opposite of insurance (risky pursuit of a gain). do you understand? Writing “risky pursuit of a gain” assumes it’s risky (and over-generalises: may be a few might be, but many won’t). It’s also an argument that stems from playing the naturalistic fallacy. These, too, are common from vaccine ‘discussions’ and many other things, too. There are some, generally rare, risks associated with vaccines, but generalising to all vaccines are “dangerous”—and some do say that—is fallacious. And in a very real sense a vaccine is in pursuit of a gain. It’s a very common line to play that something is “risky” in an exaggerated or over-generalised way, something done in opposition to many things. This comes back to the point I was making with the quote. If you think that’s a veiled poke at me, you’re making a mistake. Either way, with respect, could you look at yourself too? You’ve done your share of deflection. Even here you’ve done a small piece of redefining/shifting goalposts. It’s often sensible to not engage. There’s sense in not engaging if the person is tilting at windmills or straw men they’ve set up. I often reply once and leave it at that; it’s a common compromise. Others elect to just not reply; they’re obliged to, after all. A deep problem with people opposing things—vaccines, whatever—is that they often cannot see or won’t acknowledge they are being oppositional and using poor logic because they’re too deep in it. Away from the topic they might be fine, but on their “hot button” topic they’re all over the place – and it’s very hard to make them see it. One approach I’ve seen recommended is to try use comparisons to reasoning used in other topics, in the hope they’ll see that they’re making the same mistakes. Bad luck if they happen to also oppose that too! Linked to the wrong article at Respectful Insolence, sorry – just ignore it. Somewhere over there is a piece comparing the “strategies” used, but Google isn’t getting me there and I have to run. Could edit the comment, might later. sorry for expressing my sorrow grant – i didn’t mean to offend you. regarding keeping vaccine and gmo issues in separate conversational silos: if you are keen on this, perhaps you should consider not mentioning them together in your future communications. otherwise, readers will tend to think you are open to discussing them jointly. thanks for engaging finally on the core issue, after choosing not to do so on twitter, or in response to my first comment above. i agree with your statement that “Essentially all technologies are in “pursuit of a gain” (why develop them otherwise? ), and both have risks.” i also agree that the benefit sought by some gmos is preventative. It’s a poor idea to tell me how to write as an excuse for your behaviour and your habit of trying to “find meanings” in what I write. As I explained in my reply above it was explicit that I was making a general point that the same general fear-based approach exists for a lot of topics. It is you that linked it to GMOs in the way you did. I can’t be held for that. The over-exaggerating nonsense re silos, etc., is silly. The ‘keep on topic’ thing is a general notion (obviously, duh), and, as I indicated, a Sciblogs thing not particular to me. *Sigh*. You’re at it again. Rewriting things to fit yourself. That’s not what happened. I replied to you on Twitter about this at least twice. I noted both in my reply to you above! A problem was that your response to my first attempt was so argumentative (tart, rude, arrogant, whatever), as were some of your other responses, that it seemed sensible to leave it for a while. I replied to both you and someone else the following day, explaining it. You can’t blame me for being sensible. Ironically given your statement I’m replying to, you didn’t engage to that; you also didn’t truly engage with my first reply either, but dismissed it out-of-hand. (1) I have lot of other things to do and the world, or my world, does not revolve around you. Your mistakes are very low priority to me, and I’m not a servant at your beck and call. I’ll answer to them when I get to them, if I want to. (I’m not really obliged to answer at all when it comes to it.) (2) What I wrote after your first comment crossed over – it happens. Try not to over-read into things, eh? Finally, I told you that you got in wrong right at the very beginning (on Twitter), but it seems impossible to get you to see things unless it’s massively piled on top of you. I’d suggest you also look at your approach to things as I tried to encourage you to, and as I have tried to so many times before. You could try re-reading my article trying to see your own behaviour in the things I talk about, for example. I’ll take it that you acknowledge now that your original argument re vaccine v. GMO thinking in your first comment here was wrong, and likewise that your comments on Twitter were wrong too, and also that the other points in my reply that you don’t mention here. i’m genuinely sorry for expressing my genuine regret about expressing my genuine sorrow on learning of your disability grant. maybe you should spend less time reading meaning into my words and more time thinking about their plain meaning? as to the core issue, you say that a “trait common with people opposing” vaccines and gmos is that they don’t “try [to] understand” and instead “repeat false claims or launch insults at people”. i think this is incorrect in general and confirm that it is definitely incorrect in my case. you cite no evidence for your claim, and any evidence you do have must necessarily be derived from a tiny sample (people who have confessed this to you). since you have offered no evidence, i’m offering this scientific (i.e. falsifiable) hypothesis: your claim is inferred from the fact that some people have reached different views to you. the diversity of gmos, on which we previously agreed, is a further reason for science communicators to be cautious of conflation when characterising the views of others. the risk is that aspersions are cast at people who are potential allies in the search for truth, undermining that search. the recent arguments over Auckland’s unitary plan offer a good example of this risk: the plan’s gmo provisions were focused on outdoor release but it took some time (& legal fees) before scientists at the University of Auckland agreed that it didn’t curtail medical uses. similarly, while the gmo technologies used in cellular agriculture may have other risks, my current view is that they seem unlikely to compromise the gmo-free nature of new zealand’s primary production sectors. there is also a broader point here: effective science communication is a bit like sound public policy analysis. it requires an understanding of the diversity of views that lean against one’s preferred outcomes. You seem to think this is about you, and the settings you choose. I look more widely and I did say where I was coming from. The article is about discussions on comments in social media, initiated by two cases that I pointed to. It’s said explicitly in the opening paragraph. You don’t “win” by shifting the goalposts. Pure fantasy, presuming to know what I do or think. Try *reading* the article. Just a tip: try hard not to put on it things you “would like” to be there (or whatever). Wrong, and shows you’re reading some weirdly different, and rather argumentative, meaning from out of goodness knows where. How about all the death caused by the vaccines? What about all the other causes of child mortality that amount to substantially more than the diseases, that the government does nothing about? How about the deaths from suicide because the vaccine recipients don’t want to live with the effects any longer, or those prolonged over many years with Autoimmune diseases? How come these blogs just slag off, but don’t ever put put up independent research to support vaccines, but just put up propaganda? 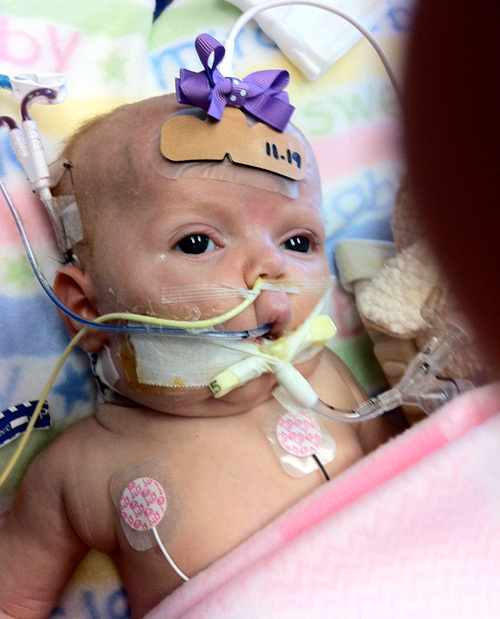 Why have you got a photo of a vaccine damaged baby right at the very top? Is there no way you can ram vaccines without emotional manipulation and personal attack? Why have you got a photo of a vaccine damaged baby right at the very top? You repeatedly accuse others of personal attacks, while issuing personal attacks. Please calm down or move to another forum if you cannot write reasonably. My blog comments are not a forum for people to launch personal attacks. Thank you. Others are not ‘obliged’ to respond to wild claims you’ve read elsewhere, your repeating other’s wild claims doesn’t make them “meaningful”, and not replying to them is not ‘convenient’. As I pointed out earlier, claims are just claims – anyone can dream up nonsense. You slag off comments as opinion that are fact on the stuff story and then you give statistics of MMR vaccinated children compared to “general” population based on an article that is opinion and has no scientific research backing it up. If all the comments on the Stuff story regarding how ineffective the vaccine is and how it only covers one strain of three and that Helen said it is wild strains causing the outbreaks, not the ones of the vaccine etc etc is just opinion, then isn’t it very easy for you to be professional about this and put up the facts here, instead of more propaganda. And how about the fact that only 1% of adverse events from vaccines are reported and the rest oppressed. NZ with less then 1% reporting. And what of the comment on the stuff blog that shows doctors are told if a child is vaccinated with MMR, to put mumps down to something else, and gives them a list of alternatives to diagnose? That was fact too, not just opinion. How come you overlook the inconvenient over and over and over again? You propagandists are the delusional in denial belligerent, pseudoscientists., Oh and most definitely dangerous! Because independent professional honest research is gagged, oppressed, annihilated and marginalized and anyone who dares speak the truth puts their lives and livelihood on the line; does not make it any less true. It just makes those doing the censoring that much more dangerous, mentally impaired and corrupt. What “death caused by the vaccines”? In New Zealand all diagnoses causing deaths, and all illnesses requiring hospital admission are freely available to the public. All of the data is published in a form that satisfies the privacy laws and prevents individuals from being identified, but if anyone has died or required hospital admission because of vaccinations then it is available to you to publish to demonstrate it has actually happened. I’ll respond only to a couple of issues you raise since I have not got the science background to discuss most of your posts. This is not to say I agree with you on anything I don’t comment on. Where is your evidence that there is 99% non-reporting because the reports are “oppressed” (I’m taking a punt here and assuming you mean “suppressed”)? By what method would any report made be suppressed? Are you aware that there is a confidential reporting system in place – that you can access it if you wish, and see what reports have been made, to make a report, or to report on behalf of another person? Are you aware that there is a history of vaccines and medications being withdrawn from use following adverse reaction reporting and investigation in New Zealand? Wow – thats down the rabbit hole. Leaving aside your hysterical and frankly paranoid language, have you got any evidence to support these claims? Who exactly are these professionals carrying out this honest independent research, and how are they gagged and marginalised? I’ll assume your use of “annihilated” was merely for dramatic effect, but if not, who has been killed in pursuit of these honest intellectual endeavors? Looking forward to your considered and factual response.